Believe it or not, these photos were taken in the mountains in eastern North Carolina. The villa, the décor, the grapes in the vineyard, and the wine, would all be right at home in the wine regions of Italy. 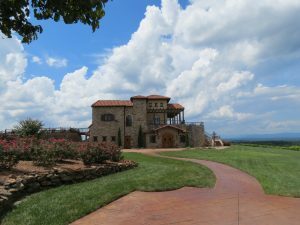 Villa Raffaldini, a 6,000 square foot tasting room is inspired by the villas in the Lombardy region of Italy; a slogan of the winery is Chianti in the Carolinas. 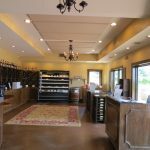 We discovered this gem of a winery three years ago and have visited each year since then. Italy is reflected in the choice of the grapes grown and the wines they produce. Montepulciano and Sangiovese are the predominant grapes featured on their wine list. 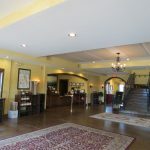 Many visitors to the tasting room are somewhat familiar with these varietals due to the popularity of Italian restaurants, where these full-bodied reds are paired with pastas and other Italian dishes. Whites, such as, Pinot Grigio and Vermentino are also regularly enjoyed by many Americans. 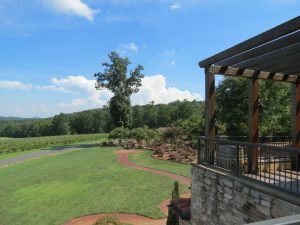 What visitors may not be accustomed to is the quality and depth of wine that these varietals produce in North Carolina. Every wine at this winery is exceptional. Our favorite is possibly a red blend, called Bella Misto. Italian for beautiful mix, this wine is a blend of those wonderful Italian grapes Montepulciano and Sangiovese with Petit Verdot, Malbec, and Pinot Noir. The result is a medium-bodied red with savory aromas and flavors of dark fruits. 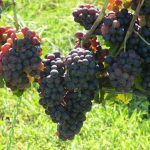 For those who enjoy a dry Rosé, their Girasole (Italian for sunflower) is made from the free run juice, skins for only 24 hours, from Montepulciano and Sangiovese. This wine has earthy aromas and flavors of red cherries. Off the beaten bath, on many side roads after you leave I-77, it is worth finding. Use their directions map on the website (check my link) or use a GPS. I definitely recommend a visit. 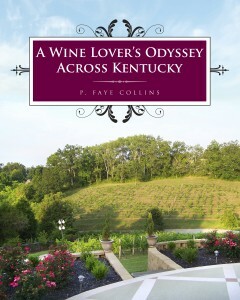 Any wine lover will find a lot to enjoy and want to return over and over. I certainly do!